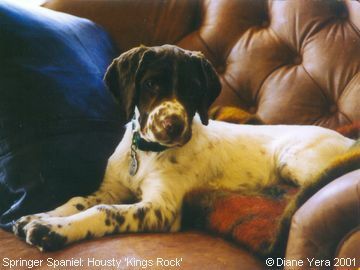 Rockford (Rock) was two years old when this photograph was taken in 2001. 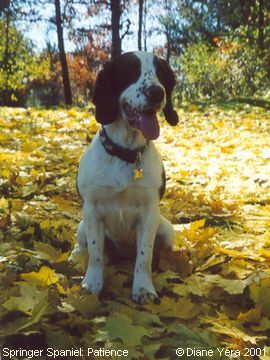 He comes from Housty Kennels, as does my Poppy but lives in Michigan with his owner Diane Yera, who very kindly sent me this, and other photographs of her gorgeous springers! Below are Audrey and Patience, Diane's other dogs. This is Audrey, mum to Patience, below, and three years old at this time. 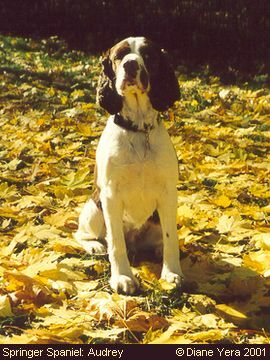 Diane describes her as a sweet little house dog, and a fabulous hunter! Patience was one year old at the time this photograph is taken, and the daughter of Rock and Audrey, photographed above. A litter-sister, ‘Izzy’, lives just down the road. What glorious colours in the ‘Fall’.